Urban living at its best! Come experience the ease and convenience of downtown living at the Park Place condominiums. Formerly the home of the Park Place school, this beautifully renovated 3 story building offers all of the charm of a bygone era, while also providing the desired modern amenities of today's savvy buyer. 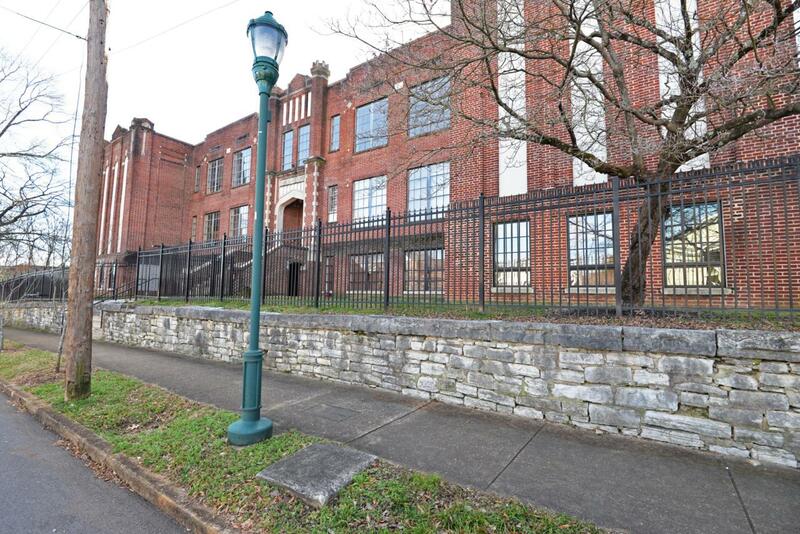 The building has secured access (intercom and fob), gated and fenced parking and elegant lobby and hallways, as well as a community balcony with views of Lookout Mountain and the delightful playground nearby. This particular unit is on the first floor and is accessible 3 different ways - directly from a covered entry beneath the front steps to the second floor lobby, via the elevator from the lobby to the first floor or from one of the sets of rear steps from the parkingarea. Access to the assigned storage space is directly across the interior hallway. As you enter the condo from the hallway, you find yourself in a dedicated foyer with the laundry room on the right and a nice coat closet on the left. You will immediately note the travertine tile floor, moldings and tall ceilings throughout. The open floor plan is versatile with the kitchen that is open to the living area, a potential gaming area and a dining area - you decide. The kitchen has granite countertops and stainless steel appliances with a raised breakfast bar for meals on the fly. There is a walk-in closet in the main living area that is perfect for a pantry or just great storage, and both bedroom suites also have walk-in closets and private baths with granite vanities and tub/shower combos with tile surround. Whether you are looking for a primary residence or a weekend city retreat, this is the perfect spot for those looking for convenience to hospitals, UTC and other schools, and of course, the allure and convenience of the downtown lifestyle, so please call for more information and to schedule your private showing today. Information is deemed reliable but not guaranteed. Buyer to verify any and all information they deem important. © 2019 Chattanooga Association of REALTORS®. INFORMATION DEEMED RELIABLE BUT NOT GUARANTEED. The site does not contain all listings available through the MLS. The Robinson Team KW Downtown. Each KW office is independently owned & operated does not display the entire MLS of Chattanooga, Inc. database on this website. The listings of some real estate brokerage firms have been excluded. IDX information is provided exclusively for consumers' personal, non-commercial use and may not be used for any purpose other than to identify prospective properties consumers may be interested in purchasing. Data is deemed reliable but is not guaranteed accurate by the MLS or The Robinson Team KW Downtown. Each KW office is independently owned & operated. This site was last updated on 2019-04-19T10:08:55.193.